"Look, I know we owe you $2 trillion dollars, but we need another couple of t and here's the hit I need you to take on Global Warming. The world is watching and I need to leave now to beat the blizzard in Washington. Do our DVD's work in China? Oh, you make them, great. Well contact my office for a box set of my speeches. Sovereignty is so 20th century, don't you agree?" 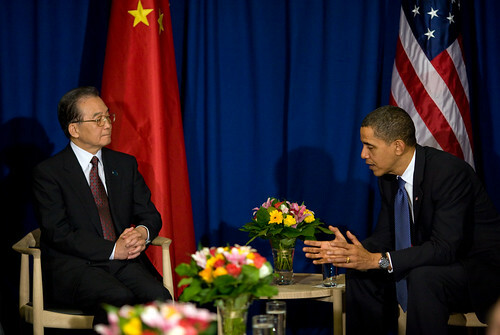 The day's most remarkable feature was a direct and unprecedented personal clash between the US President, Barack Obama, and the Chinese Premier, Wen Jiabao, in which Mr Wen took deep offence at Mr Obama's insistence – in public – that the Chinese should allow their promised cuts in greenhouse gases to be internationally verified. When the President, in an unyielding speech, said that without international verification "any agreement would be empty words on a page", that was too much for Mr Wen. He left the conference in Copenhagen's Bella Centre, returned to his hotel in the city, and responded with a direct snub of his own – he sent low-level delegates to take his place in the talks.